Define static electricity and explains how it is built up and what happens when it discharges. This notes sheet comes with an (A) version that has blanks for students to fill out as well as a completed (B) version for students who are absent or may require accommodations. Students are asked to read a short article about static electricity then write a summary of the article in their own words. 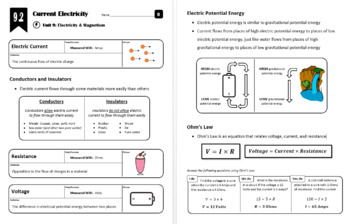 This page includes URLs for several different interactive computer simulations where students can explore the idea of static electricity. The instructions on the page lead students through the simulations, having them answer questions along the way. Learning objectives and sample starter questions for the topic. Notes in PowerPoint format to make presentation to the class a breeze. Explains the different between electrical conductors and insulators and introduces resistance, current, and voltage and how to calculate each using Ohm's Law. 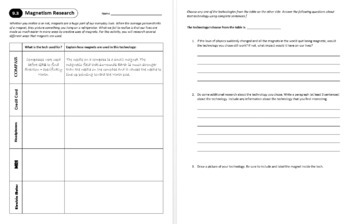 This notes sheet comes with an (A) version that has blanks for students to fill out as well as a completed (B) version for students who are absent or may require accommodations. Students practice using Ohm's Law to solve for voltage, current, and resistance. This practice sheet comes with an (A) version to be used for the majority of students as well as a shorter and/or different (B) version to be used for students who are absent or may require accommodations. This page includes a URL for an interactive computer simulation where students can build their own circuit. The instructions on the page lead students through the simulation, having them answer questions along the way. Introduces the concept of magnets and magnetic fields and describes Earth's magnetic field and its effect on compasses. 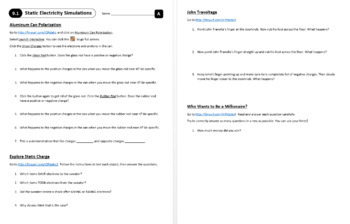 This notes sheet comes with an (A) version that has blanks for students to fill out as well as a completed (B) version for students who are absent or may require accommodations. 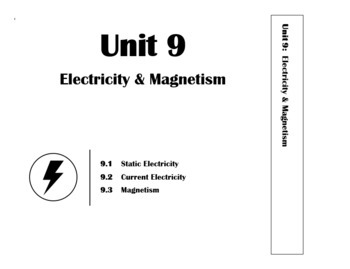 This page can be used to get students engaged with what they are learning about magnetism. Students are asked to use the internet to research several different technologies that use magnetism, describe how magnetism is involved, and think about a world without magnetic technology. This page can be printed and trimmed along the edge slightly to make a helpful binder divider. I find that these dividers for each unit help students stay organized. This test includes true/false, matching, multiple choice, short answer, and calculation questions covering the entire unit. This short recovery quiz gives students an opportunity to recover from a poor test score. The quiz includes the most commonly-missed questions from my experience. I have all students take the quiz and give them 1/2 point per question back on their test score up to 100%.